Aaron Blythe (center) and Richard Matos-Haile give supplies to Melissa, who is homeless in Malden. Stuck in what feels like a never-ending bureaucratic rabbit hole, Stephen Howard has struggled to find permanent housing. Homeless for the last 4½ years, Howard, 47, stayed in a shelter on Boston’s Long Island until it closed in 2014. Then he lived at his mother’s home in Roxburyfor a while, but had to leave when his grandmother, who has dementia, moved in. He’s now living in his car and has been turned down by many housing assistance programs because of various requirements he was unable to meet. “It seems like every chance I get or every step I make to getting some sort of housing over my head, another door is shut in my face,” Howard said. One group that has been able to help Howard is the Mobile Homeless Outreach Team, a staff of three that drives a van around Malden, Medford, and Everett, looking for people who are living on the streets. They met Howard at an intersection in Everett where he sometimes sleeps. The team hands out blankets and toiletries to the people they find near libraries, strip malls, and ATMs. They transport those with no place to stay to appointments and shelters, especially during the cold winter months. The goal is to establish trust and convince those who are reluctant to go to a shelter in Boston, or help them apply for housing and assistance programs. After getting picked up by the Mobile Homeless Outreach Team, James searches through a bag of donated hats inside the ABCD office in Malden. 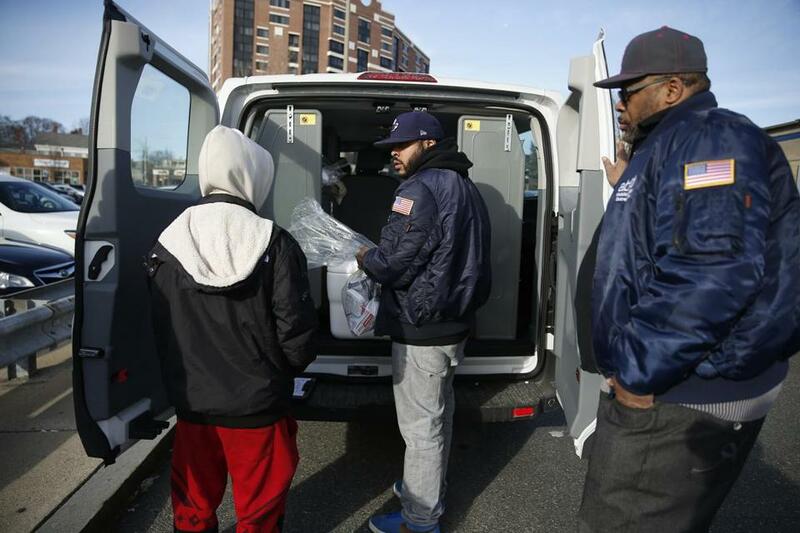 Now, funding from the Department of Housing and Urban Development for the mobile unit, a program run by Action for Boston Community Development, has dried up. It was out of money as of Feb. 28, but an $8,000 grant from the City of Malden will allow the van to run at reduced capacity through March. The HUD grant was for $165,000. Sharon Scott-Chandler, ABCD’s executive vice president, said the mobile program could get by on $100,000 per year. She and other program administrators are concerned there will be a gap in services for the homeless people in the three cities north of Boston where the van has operated. While Boston has a range of resources and other nearby cities such as Cambridge and Somerville have shelters, Malden, Medford, and Everett have only an emergency family shelter, in Malden. They are worried about people who do not have the means to make it to the outreach office at 6 Pleasant St. in Malden. “People will have to come to the office,” said Richard Matos-Haile, the van’s coordinator. “For this particular population, they stay where they are for whatever reason. In particular, Matos-Haile recalled a woman in her 60s whom the team had recently convinced to apply for permanent housing in Malden. She had resisted, and Matos-Haile said the relationship he and his team have built by driving her to the shelter often was instrumental in her agreeing to seek permanent housing. A spokeswoman for the regional office of the Department of Housing and Urban Development said housing-based programs are typically prioritized. “There is a heavy emphasis on funding those organizations that have a housing-first focus; those programs have been shown to have the most success in keeping people stably housed,” said Rhonda Siciliano in an e-mail. While the mobile team doesn’t provide its clients with housing, it offers other critical support services. Howard has gotten toiletries that he uses to wash up in a McDonald’s or hospital restroom, along with clean undershirts. The team also has tried to help him find employment since he lost his job in December transporting elderly people to grocery stores and medical appointments. That happened when his nephew died and he took time off to be with his family. Howard said he met with the mobile team about twice each week. They would ask where he was parked and then meet him. Terrick Smith, another client of the van, became homeless when the utilities were cut off at the apartment he was renting in Malden. He couch-surfed for a while, then found emergency placement through ABCD at the Southampton Street Shelter in Boston. The mobile team met with Smith about once a week to help him look for more permanent housing and to provide him with gift cards and vouchers to help him purchase food and clothing. He now lives in the Lifebridge shelter in Salem, which provides support services to help people make a living and improve their physical and mental health. 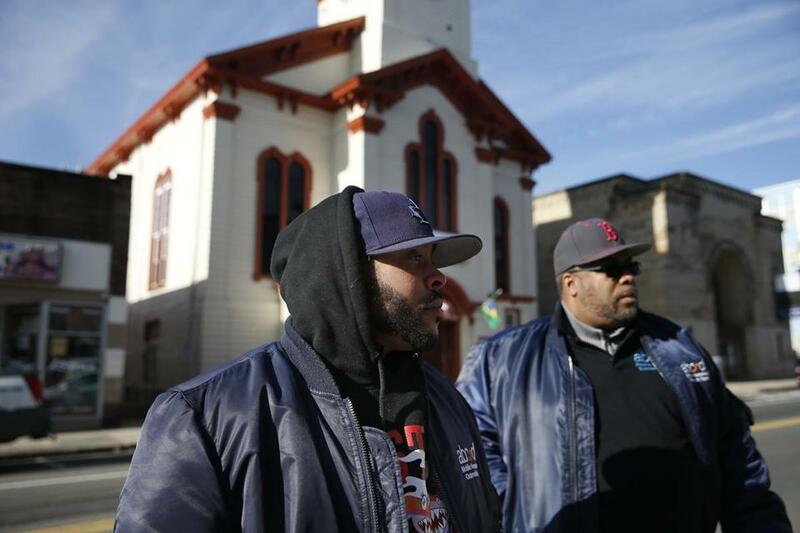 To continue the Malden-based mobile program, ABCD is looking for help from other sources. Aaron Blythe (left) and Richard Matos-Haile talk with a person in need of housing assistance on Broadway in Everett.